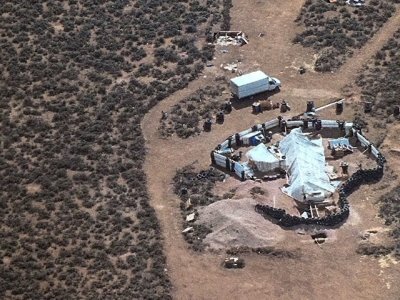 TAOS, N.M. (AP) — A father arrested at a ramshackle New Mexico compound where 11 hungry children were found living in filth was training youngsters to commit school shootings, prosecutors said in court documents obtained Wednesday. The documents say Wahhaj was conducting weapons training with assault rifles at the compound on the outskirts of Amalia, a tiny town near the Colorado border marked by scattered homes and sagebrush. “He poses a great danger to the children found on the property as well as a threat to the community as a whole due to the presence of firearms and his intent to use these firearms in a violent and illegal manner,” Prosecutor Timothy Hasson wrote in the court documents Wednesday. Authorities raided the compound Friday in an investigation that has yielded a series of startling revelations — including the discovery of the 11 children in rags and word that Wahhaj wanted to perform an exorcism on his son because he thought the boy was possessed by the devil. Prosecutor Timothy Hasson filed the court documents while asking that Wahhaj be held without bail after he was arrested last week with four other adults at the compound facing child abuse charges. In the court documents, authorities said a foster parent of one of the children removed from the compound had told authorities the child had been trained to use an assault rifle in preparation for a school shooting. Aleks Kostich of the Taos County Public Defender’s Office questioned the accusation of a school shooting conspiracy, saying the claim was presented with little information beyond the explanation that it came from a foster parent. The elder Wahhaj heads the Masjid At-Taqwa in Brooklyn, a mosque that has attracted radical speakers over the years. He met Mahmud Abouhalima when he came to the site to raise money for Muslims in Afghanistan. Abouhalima later helped bomb the World Trade Center in 1993. In a Georgia arrest warrant, authorities said 39-year-old Siraj Ibn Wahhaj had told his son’s mother that he wanted to perform an exorcism on the child. He later said he was taking the child to a park and didn’t return. For months, neighbors worried about the squalid compound built along the remote New Mexico plain, saying they took their concerns to authorities long before sheriff’s officials raided the facility described as a small camping trailer in the ground. Authorities found what Hogrefe called “the saddest living conditions and poverty” he has seen in 30 years in law enforcement. He said Wahhaj was armed with multiple firearms, including an assault rifle. But he was taken into custody without incident. As the months passed, he said he stopped seeing the smaller children playing in the area and didn’t hear guns being fired at a shooting range on the property. However, a judge dismissed an eviction notice filed by Badger against Morton in June, court records said. The records did not provide further details on the judge’s decision. Hudetz reported from Albuquerque. Associated Press writers Kate Brumback in Atlanta, and Russell Contreras in Albuqerque, N.M., contributed to this report.